It was a pleasant surprise when I saw a plastic basket full of Gaja Promis at the departure lounge of the Delhi T-3 last Sunday. Priced at US$47, the sales girl told me that they had just received the consignment (I had to correct her it was not pronounced as Ga-Ja but Ga-yya). Priced at $35-45 in the international retail, it may not be as attractively priced as Gaja Dagromis Barolo at around $60 (international retail price $65-90 –Source: wine-searcher.com). No wonder, the sales girl today told me they had already sold out most of their Barolos- there was none at the Arrival lounge when I visited today. 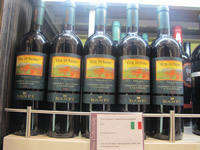 For the price conscious, there is Col di Sasso, a blend of Cabernet Sauvignon and Sangiovese (call it a Super Tuscan and it will taste even better) from the Tuscan winery Banfi. At $13 it is decidedly the Best Buy- though the entry level wine sells for around $8-10 in international retail. 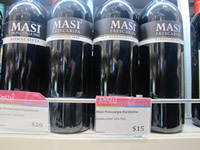 If you love low alcohol, light wines like Valpolicella styled wines, Masi Valpolicella at $20 may be expensive but the very similar Masi Bardolino Frescaripa at $15 is a better buy. For white wine lovers, Villa Maria Sauvignon Blanc and Chardonnay at $18 are still the reasonable options. 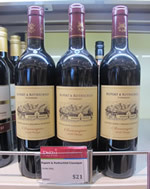 My personal all-time favourite and a good value for money wine is Rupert Rothschild Classique from South Africa at $21. At international retail price of $15-20, it may not be as attractive at say, Dagromis selling at lower than international prices, but the Classique Bordeaux blend with silky tannins is a welcome buy, if you could not pick it up at any discount store in the US or UK and pack it in your suitcase. Although there is still not much shelf space given to wines- ostensibly it is precious and spirits always rule the roost, decidedly the wines are getting more prominence and time is not far when the sales would pick up even more. Unfortunately, no sales incentives and attractions are offered to the consumer at the display. The shops will do well to plan special offers-Deal of the Month- like Piper Heidsieck Rose Brut offering 25 % discount on the $50 offer price a couple of months ago. I was quick enough to pick up 2 bottles each on 2 occasions earlier. Not only has the offer been withdrawn now, the price has been raised to $54- perhaps still a good price for this champagne. As I wrote earlier, the wine suppliers and the store owners must focus on this marketing aspect. 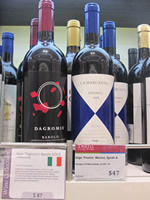 It was heartening to notice for the first time, the desire on part of the employees to try to sell wines aggressively. The woman (Neeta Butia) looking after the wine sales at Arrivals knew about the stock position and actually tried to get me to commit the purchase of Gaja Barolo during my next trip (tomorrow). She did concede that wine knowledge among the sales staff was sparse. There had been a couple of educational programmes organised but not enough. This is an ongoing effort and will help the sales in the long run. Otherwise, not much has changed in the Duty Free shop. You are still being captivated with the offers of savings of up to 70% on cigarettes. At $18 a carton, they cost no less than the price I found in the Jet Airways flight but must be their best seller product category, considering the significant price difference in the local market for the imported counterparts. At $2 miniscule discount on the $35 Cloudy Bay Sauvignon Blanc (the only so-called offer on wine), on the other hand has had predictably, no effect on the sales. An interesting feature now added is that of pre-ordering for Indians going abroad. If there is a special offer or if you like something and are not sure if it would be available on your return, this may be pre-ordered and paid for. You may pick it up on your return. Before someone notices, most of the items recommended are supplied by Brindco. I have noticed it too but apparently they are the major contracted vendor and almost everything on display has been supplied by them. I have focused on the wines on display and tried to be helpful to our readers who may ask their friends and family members to pick up some of the better bargains- remember to pick up 3 bottles (2.25 liters)- the official limit is 2 liters. Dateline Delhi T-3 Oct 9: It looks like I was too quick and generous to praise the sales management and the aggressive style of wine marketing, after all. As I found at the Departure lounge today on my way to Singapore, the Gaja Dagromis Barolo 2004 was tagged at $87 a bottle and not $60 that I was told by the sales in-charge yesterday at the Arrivals Duty Free. It is still at the international prices- but duty and tax paid suggested retail price. This brings me back to yet another aspect about Duty Free business which has internationally become a sophisticated form of retail with captive customers who have no time for shopping around and need to pick up something in a hurry and are willing to pay the extra dollars for the convenience and due to the impulsive nature of such shopping. The extremely high rentals and other overheads justify the additional costs paid by the stores and naturally passed on to the consumers- reminding you of the cliché that these shops are duty free-not profit free.